Liczba stron: 360 Jest to ujednolicona liczba stron, która ułatwi Ci porównanie długości książek. Każda strona Legimi to 200 słów. The book tells satiric biographical story of an early 18th century underworld boss Jonathan Wild, from his birth in 1682 until his execution in 1725. Fielding's biography of Jonathan Wild allows him to satirize various aspects of English society at the time. Jonathan Wild, born about 1682 and executed at Tyburn in 1725, was one of the most notorious criminals of his age. His resemblance to the hero in Fielding’s satire of the same name is general rather than particular. The real Jonathan (whose legitimate business was that of a buckle-maker) like Fielding’s, won his fame, not as a robber himself, but as an informer, and a receiver of stolen goods. His method was to restore these to the owners on receipt of a commission, which was generally pretty large, pretending that he had paid the whole of it to the thieves, whom for disinterested motives he had traced. He was a great organiser, and he controlled various bands of robbers whose lives he did not hesitate to sacrifice, when his own was in danger. Naturally he was so hated by many of his underlings that it is a wonder he was able to maintain his authority over them as many years as he did. His rascality had been notorious a long time before his crimes could actually be proved. He was executed at last according to the statute which made receivers of stolen goods equally guilty with the stealers. Jonathan Wild was published as the third volume of the Miscellanies “by Henry Fielding, Esq.” which came out in the spring of 1743. From the reference to Lady Booby’s steward, Peter Pounce, in Book II., it seems to have been, as Mr. Austin Dobson has observed, and as the date of publication would imply, composed in part at least subsequently to Joseph Andrews, which appeared early in 1742. But the same critic goes on to say that whenever completed, Jonathan Wild was probably “planned and begun before Joseph Andrews was published, as it is in the highest degree improbable that Fielding, always carefully watching the public taste, would have followed up that fortunate adventure in a new direction by a work so entirely different from it as Jonathan Wild.” [Footnote: Henry Fielding, 1900, p. 145.] Mr. Dobson’s surmise is undoubtedly correct. The “strange, surprising adventures” of Mrs. Heartfree belong to a different school of fiction from that with which we commonly associate Fielding. They are such as we should expect one of Defoe’s characters to go through, rather than a woman whose creator had been gratified only a year before at the favourable reception accorded to Fanny and Lady Booby and Mrs. Slipslop. That Jonathan Wild is for the most part a magnificent example of sustained irony, one of the best in our literature, critics have generally agreed. The comparison steadfastly insisted upon between Jonathan Wild’s greatness and the greatness which the world looks up to, but which without being called criminal is yet devoid of humanity, is admirable. Admirable, too, is the ironical humour, in which Fielding so excelled, and which in Jonathan Wild he seldom drops. It would take too long to mention all the particularly good ironical passages, but among them are the conversation between Wild and Count La Ruse, and the description of Miss Tishy Snap in the first book; the adventures of Wild in the boat at the end of the second book; and, in the last, the dialogue between the ordinary of Newgate and the hero, the death of Wild, and the chapter which sets forth his character and his maxims for attaining greatness. And yet as a satire Jonathan Wild is not perfect. Fielding himself hits upon its one fault, when, in the last book, after the long narrative of Mrs. Heartfree’s adventures by sea and by land, he says, “we have already perhaps detained our reader too long ... from the consideration of our hero.” He has detained us far too long. A story containing so much irony as Jonathan Wild should be an undeviating satire like A Tale of a Tub. The introduction of characters like the Heartfrees, who are meant to enlist a reader’s sympathy, spoils the unity. True, the way they appear at first is all very well. Heartfree is “a silly fellow,” possessed of several great weaknesses of mind, being “good-natured, friendly, and generous to a great excess,” and devoted to the “silly woman,” his wife. But later Fielding becomes so much interested in the pair that he drops his ironical tone. Unfortunately, however, in depicting them, he has not met with his usual success in depicting amiable characters. The exemplary couple, together with their children and Friendly, are much less real than the villain and his fellows. And so the importance of the Heartfrees in Jonathan Wild seems to me a double blemish. A satire is not truth, and yet in Mr. and Mrs. Heartfree Fielding has tried—though not with success—to give us virtuous characters who are truly human. The consequence is that Jonathan Wild just fails of being a consistently brilliant satire. As to its place among Fielding’s works, critics have differed considerably. The opinion of Scott found little in Jonathan Wild to praise, but then it is evident from what he says, that Scott missed the point of the satire. [Footnote: Henry Fielding in Biographical and Critical Notices of Eminent Novelists. “It is not easy to see what Fielding proposed to himself by a picture of complete vice, unrelieved by anything of human feeling. ...”]. Some other critics have been neither more friendly than Sir Walter, nor more discriminating, in speaking of Jonathan Wild and Smollett’s Count Fathom in the same breath, as if they were similar either in purpose or in merit. Fathom is a romantic picaresque novel, with a possibly edifying, but most unnatural reformation of the villainous hero at the last; Jonathan Wild is a pretty consistent picaresque satire, in which the hero ends where Fathom by all rights should have ended,—on the gallows. 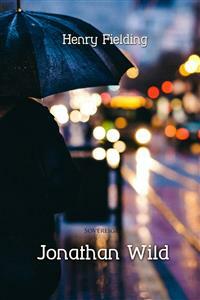 Fathom is the weakest of all its author’s novels; Jonathan Wild is not properly one of Fielding’s novels at all, but a work only a little below them. For below them I cannot help thinking it, in spite of the opinion of a critic of taste and judgment so excellent as Professor Saintsbury’s. When this gentleman, in his introduction to Jonathan Wild, in a recent English edition of Fielding’s works, says that: “Fielding has written no greater book,” he seems to me to give excessive praise to a work of such great merit that only its deserved praise is ample. A great satire, I should say, is never the equal of a great novel. In the introductions which I have already written, in trying to show what a great novel is, I have said that an essential part of such a book is the reality of its scenes and characters. Now scenes and characters will not seem real, unless there is in them the right blend of pleasure and pain, of good and bad; for life is not all either one thing or the other, nor has it ever been so. Such reality is not found in a satire, for a satire, as distinguished from a novel, both conceals and exaggerates: it gives half-truths instead of whole truths; it shows not all of life but only a part; and even this it cannot show quite truly, for its avowed object is to magnify some vice or foible. In doing so, a satire finds no means so effective as irony, which makes its appeal wholly to the intellect. A good novel, on the contrary, touches the head and the heart both; along with passages which give keen intellectual enjoyment, it offers passages which move its reader’s tears. Still, a good novelist without appreciation of irony cannot be imagined, for without the sense of humour which makes irony appreciated, it is impossible to see the objects of this world in their right proportions. Irony, then, which is the main part of a satire, is essential to a good novel, though not necessarily more than a small part of it. Intellectually there is nothing in English literature of the eighteenth century greater than A Tale of a Tub or the larger part of Gullivers Travels; intellectually there is nothing in Fielding’s works greater than most of Jonathan Wild; but taken all in all, is not a novel like Tom Jones, with its eternal appeal to the emotions as well as the intellect, greater than a perfect satire? Even if this be not admitted, Jonathan Wild, we have already seen, is not a perfect satire. For a work of its kind, it is too sympathetically human, and so suffers in exactly the opposite way from Vanity Fair, which many people think is kept from being the greatest English novel of the nineteenth century because it is too satirical. No, I cannot agree with Professor Saintsbury that “Fielding has written no greater book” than Jonathan Wild. It was unquestionably the most important part of the Miscellanies of 1743. Its brilliancy may make it outrank even that delightful Journal of the Voyage to Lisbon. A higher place should not be claimed for it. Mr. Dobson, in his Henry Fielding, has assigned the right position to Jonathan Wild when he says that its place “in Fielding’s works is immediately after his three great novels, and this is more by reason of its subject than its workmanship,” which if not perfect, is yet for the most part excellent. CHAPTER ONE — SHEWING THE WHOLESOME USES DRAWN FROM RECORDING THE ACHIEVEMENTS OF THOSE WONDERFUL PRODUCTIONS OF NATURE CALLED GREAT MEN. CHAPTER TWO — GIVING AN ACCOUNT OF AS MANY OF OUR HERO’S ANCESTORS AS CAN BE GATHERED OUT OF THE RUBBISH OF ANTIQUITY, WHICH HATH BEEN CAREFULLY SIFTED FOR THAT PURPOSE. What first gave rise to this method is somewhat difficult to determine. Sometimes I have thought that the hero’s ancestors have been introduced as foils to himself. Again, I have imagined it might be to obviate a suspicion that such extraordinary personages were not produced in the ordinary course of nature, and may have proceeded from the author’s fear that, if we were not told who their fathers were, they might be in danger, like prince Prettyman, of being supposed to have had none. Lastly, and perhaps more truly, I have conjectured that the design of the biographer hath been no more than to shew his great learning and knowledge of antiquity. A design to which the world hath probably owed many notable discoveries, and indeed most of the labours of our antiquarians. O shame o’ justice! Wild is hang’d, For thatten he a pocket fang’d, While safe old Hubert, and his gang, Doth pocket o’ the nation fang. after some consultation, unanimously agreed on the said murder. CHAPTER THREE — THE BIRTH, PARENTAGE, AND EDUCATION OF MR. JONATHAN WILD THE GREAT. he might possibly have named Mercury to her (for he had heard of such an heathen god), he never in his life could anywise have put her in mind of that other deity, with whom he had no acquaintance. He was a passionate admirer of heroes, particularly of Alexander the Great, between whom and the late king of Sweden he would frequently draw parallels. He was much delighted with the accounts of the Czar’s retreat from the latter, who carried off the inhabitants of great cities to people his own country. THIS, he said, WAS NOT ONCE THOUGHT OF BY Alexander; BUT added, PERHAPS HE DID NOT WANT THEM. CHAPTER FOUR — MR. WILD’S FIRST ENTRANCE INTO THE WORLD. HIS ACQUAINTANCE WITH COUNT LA RUSE. being thereto well warranted, had laid violent hands on, or, as the vulgar express it, arrested one count La Ruse, a man of considerable figure in those days, and had confined him to his own house till he could find two seconds who would in a formal manner give their words that the count should, at a certain day and place appointed, answer all that one Thomas Thimble, a taylor, had to say to him; which Thomas Thimble, it seems, alleged that the count had, according to the law of the realm, made over his body to him as a security for some suits of cloaths to him delivered by the said Thomas Thimble. Now as the count, though perfectly a man of honour, could not immediately find these seconds, he was obliged for some time to reside at Mr. Snap’s house: for it seems the law of the land is, that whoever owes another 10 pounds, or indeed 2 pounds, may be, on the oath of that person, immediately taken up and carried away from his own house and family, and kept abroad till he is made to owe, 50 pounds, whether he will or no; for which he is perhaps afterwards obliged to lie in gaol; and all these without any trial had, or any other evidence of the debt than the above said oath, which if untrue, as it often happens, you have no remedy against the perjurer; he was, forsooth, mistaken. But though Mr. Snap would not (as perhaps by the nice rules of honour he was obliged) discharge the count on his parole, yet did he not (as by the strict rules of law he was enabled) confine him to his chamber. The count had his liberty of the whole house, and Mr. Snap, using only the precaution of keeping his doors well locked and barred, took his prisoner’s word that he would not go forth. Men of great genius as easily discover one another as freemasons can. It was therefore no wonder that the count soon conceived an inclination to an intimacy with our young hero, whose vast abilities could not be concealed from one of the count’s discernment; for though this latter was so expert at his cards that he was proverbially said to PLAY THE WHOLE GAME, he was no match for master Wild, who, inexperienced as he was, notwithstanding all the art, the dexterity, and often the fortune of his adversary, never failed to send him away from the table with less in his pocket than he brought to it, for indeed Langfanger himself could not have extracted a purse with more ingenuity than our young hero. with little innocent freedoms about her person in return, he thought himself obliged to be contented; but one night, when Wild imagined the count asleep, he made so unguarded an attack upon him, that the other caught him in the fact: however, he did not think proper to acquaint him with the discovery he had made, but, preventing him from any booty at that time, he only took care for the future to button his pockets, and to pack the cards with double industry. CHAPTER FIVE — A DIALOGUE BETWEEN YOUNG MASTER WILD AND COUNT LA RUSE, WHICH, HAVING EXTENDED TO THE REJOINDER, HAD A VERY QUIET, EASY, AND NATURAL CONCLUSION. One evening, after the Miss Snaps were retired to rest, the count thus addressed himself to young Wild: “You cannot, I apprehend, Mr. Wild, be such a stranger to your own great capacity, as to be surprised when I tell you I have often viewed, with a mixture of astonishment and concern, your shining qualities confined to a sphere where they can never reach the eyes of those who would introduce them properly into the world, and raise you to an eminence where you may blaze out to the admiration of all men. I assure you I am pleased with my captivity, when I reflect I am likely to owe to it an acquaintance, and I hope friendship, with the greatest genius of my age; and, what is still more, when I indulge my vanity with a prospect of drawing from obscurity (pardon the expression) such talents as were, I believe, never before like to have been buried in it: for I make no question but, at my discharge from confinement, which will now soon happen, I shall be able to introduce you into company, where you may reap the advantage of your superior parts. with exerting my talents well at the head of a small party or gang, as in the command of a mighty army; for I am far from agreeing with you, that great parts are often lost in a low situation; on the contrary, I am convinced it is impossible they should be lost. I have often persuaded myself that there were not fewer than a thousand in Alexander’s troops capable of performing what Alexander himself did.